Influenza virus shedding (the time during which a person might be infectious to another person) begins the day before symptoms appear and virus is then released for between 5 to 7 days, although some people may shed virus for longer periods. People who contract influenza are most infective between the second and third days after infection.The amount of virus shed appears to correlate with fever, with higher amounts of virus shed when temperatures are highest. Children are much more infectious than adults and shed virus from just before they develop symptoms until two weeks after infection. The transmission of influenza can be modeled mathematically, which helps predict how the virus will spread in a population. The relative importance of these three modes of transmission is unclear, and they may all contribute to the spread of the virus. In the airborne route, the droplets that are small enough for people to inhale are 0.5 to 5 µm in diameter and inhaling just one droplet might be enough to cause an infection (see figure 1). Although a single sneeze releases up to 40,000 droplets, most of these droplets are quite large and will quickly settle out of the air. How long influenza survives in airborne droplets seems to be influenced by the levels of humidity and UV radiation: with low humidity and a lack of sunlight in winter aiding its survival. Figure 1. 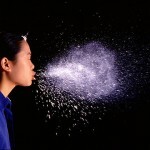 Transmission of influenza virus through sneezing. Droplet nuclei (airborne) transmission entails the production of infectious droplet nuclei, generally 5 micrometers or less in diameter. In contrast with larger droplets, these droplets can remain suspended in the air and be disseminated by air currents in a room or through a facility, to be inhaled by a susceptible host. As the influenza virus can persist outside of the body, it can also be transmitted by contaminated surfaces such as banknotes, doorknobs, light switches and other household items. The length of time the virus will persist on a surface varies, with the virus surviving for one to two days on hard, non-porous surfaces such as plastic or metal, for about fifteen minutes from dry paper tissues, and only five minutes on skin. However, if the virus is present in mucus, this can protect it for longer periods (up to 17 days on banknotes). Avian influenza viruses can survive almost indefinitely when frozen. They are inactivated by heating to 56 °C (133 °F) for a minimum of 60 minutes, as well as by acids (at pH <2). Common symptoms of the flu such as fever, headaches, and fatigue are the result of the huge amounts of proinflammatory cytokines and chemokines (such as interferon or tumor necrosis factor) produced from influenza-infected cells. 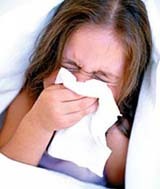 In contrast to the rhinovirus that causes the common cold, influenza does cause tissue damage, so symptoms are not entirely due to the inflammatory response. This massive immune response might produce a life-threatening cytokine storm. This effect has been proposed to be the cause of the unusual lethality of both the H5N1 avian influenza, and the 1918 pandemic strain. However, another possibility is that these large amounts of cytokines are just a result of the massive levels of viral replication produced by these strains, and the immune response does not itself contribute to the disease.